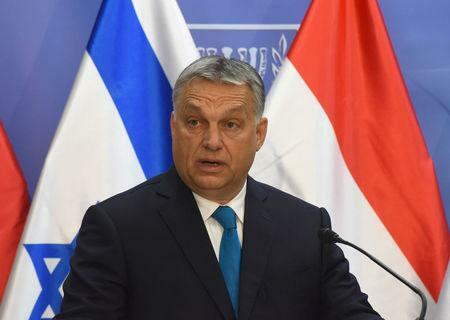 BUDAPEST (Reuters) - New management close to Prime Minister Viktor Orban took over a prominent Hungarian news television channel on Wednesday, cementing his ruling Fidesz party's dominance of the media as it solidifies its hold on power. Orban won a third successive landslide in elections in April and set his sights on imprinting his anti-immigration politics on the European Union. His political base at home is robust, including a strong sway over most of the country's print and broadcast media via a tight grip over the market regulator and allies who own an ever increasing number of outlets. The news channel, Hir TV, was part of a broad package deal between buyer Zsolt Nyerges, an Orban loyalist, and the tycoon Lajos Simicska, a former Orban ally who fell out with the premier in 2015. Simicska was a prominent opponent of Orban during the 2018 election campaign but his open support for the opposition nationalist Jobbik party failed to bring about the political change he desired as Jobbik was soundly beaten. Simicska shut down his flagship newspaper and a radio station days later, flagging changes at Hir TV. He then sold all his remaining business interests to Nyerges, including the once-formidable construction giant Kozgep and other holdings. Nyerges made a rare public appearance at Hir TV on Wednesday. "Hir TV's situation is stable, the channel will continue to operate and its future will be secured," he told news and other staff according to a video by the news website HVG.hu. Nyerges said he appointed pro-government media manager Gabor Liszkay to oversee Hir TV's operations. Liszkay was once a key Simicska media operative who then sided with Orban during the pair's split and now heads the media company Mediaworks, a cornerstone of a pro-Fidesz media empire with a vast network of newspapers and magazines. Liszkay was not immediately available for comment on Hir TV's future political line. Although Nyerges is widely described in Hungary's opposition media as a family friend of the prime minister, he did not address that nor did he answer questions while speaking to Hir TV staff. Journalists were left in shock after the announcements of the new management, which one journalist present at the forum said brought back the old guard that directed the pro-Fidesz coverage before 2015. "It's a bit of a deja vu," the journalist said, adding that the relative editorial freedom enjoyed while employed by an opposition owner was now lost again. "This is the old guard returning."